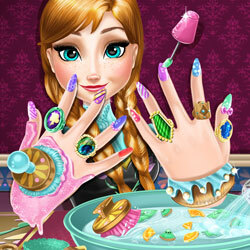 Description: Winter is over and it's time for the ice princess to get a hands spa treatment and a manicure that matches her unique style. Use the fruit based beauty mask to moisturize and clean up her hands, then repair her nails using the special tools. She is now ready for a creative nail art! Go crazy with patterns, nail polish and royal accessories like rings or bracelets, you can have loads of fun making different combinations over and over again, each one more colorful and original.